How They Came Out in the Fifties. "It is consolatory to reflect that while other nations are fighting for social existence and preventing an excess of population by fratricidal war, we are bridging over the immensity of the ocean to encourage clamorous and discontented multitudes to fly to a land of exuberant plenty; and that instead of slaughtering men at the barricades we are enabling them to build up a mighty Empire in a distant land, in which they can enjoy every political and social blessing." The vessel in question sailed from New York, bound to Melbourne, with about 140 passengers. Scarcely, however, had she got out to sea before the provisions were discovered to be of the poorest and most objectionable description. Taking no less than seven weeks to reach the Line, she must, considering that she had favourable winds, have been a wonderfully poor sailer, as well as an ill-found ship. The passengers at this point remonstrated with the master, and he put into Rio Janiero for a fresh supply of provisions. Endless squabbles had been the rule so far; indeed, the ship entered Rio with the American flag reversed in sign of trouble. To make matters worse, no one could be found to advance any money upon the vessel. Therefore, fresh provisions could not be procured. Presently the captain started back to New York to endeavour to raise the necessary funds. After he departed matters became worse than ever; the mate had been left in charge, and the food became simply abominable. Luckily, the British Consul interfered (many of the passengers were Canadians), and succeeded in procuring decent provisions for the unfortunate people. 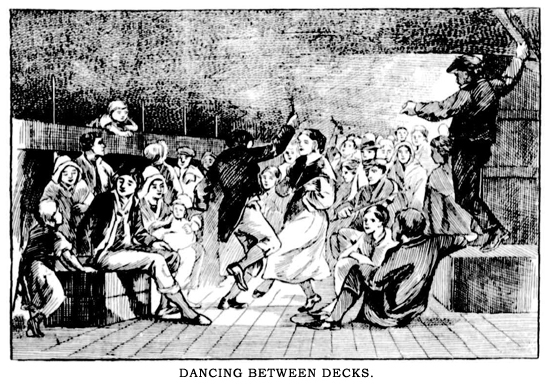 But the delay was to have fatal consequences; yellow fever broke out on board; and during the next four months of the ship's stay played havoc with the immigrants. 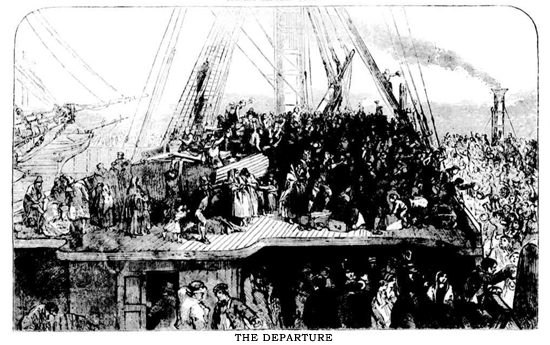 Those who could afford it—very few—took passage in another New York ship bound to Melbourne, and from them the "Argus" of that day got the lamentable story. "Our American citizens" are also called upon "to mark such a detestable occurrence with the punishment and odium it so deeply merits. Such a want of foresight, followed by such a breach of honourable engagement, and such a contempt for suffering and death we have rarely heard of; and surely it will not be allowed to pass without receiving such a punishment as will prevent the like ever recurring." It will thus be seen that in some instances at least, early emigration to Australia was not all "cakes and ale" by any means. And that even on the best appointed vessels there was an appalling amount of overcrowding, in addition to a large proportion of what we in these days would term "undesirable" or "restricted immigrants," or something of the kind, is shown by the experiences of those on board the Hercules, then a 74-gun ship in the Royal Navy. She left the Isle of Skye, with nearly 800 Scottish emigrants for Australia; and was sent out by the Highlands Emigration Society. However, in consequence of fever and smallpox breaking out on board she got no further than Cork. Four months later she made another start, with her complement reduced to 320 by death, sickness, and by others left behind to look after relatives and friends. Sixty-four days brought her to Capetown, and eventually she reached her original destination after a very long passage. Sickness among a crowd of people cooped up for months together within the narrow limits of shipboard, no matter what efforts were made for their comfort and sanitary needs—appears in those days to have been, indeed, inevitable. But they generally managed to get further than did the Hercules before the ill-effects of confinement or diet showed themselves. Thus when the Earl of Elgin spoke the Empire, of Liverpool, bound to Sydney with emigrants, the latter was nearing the coast of New South Wales. She was also short of provisions; she also had scurvy on board, and the doctor, his wife, and child, and several passengers had died. This same Empire made a long passage of 148 days, during which altogether 15 deaths occurred through scurvy. She carried only coals as cargo—a curious fact, considering that at the time there was a tremendous demand in the colony for almost everything else. Sometimes, too, but with fortunate rarity, it happened that the emigrants have been landed far too abruptly for comfort on the shores of their adopted country—a fate hard, indeed, after successfully surviving the perils of the outward passage. Thus the Earl of Charlemont, of 878 tons, with 435 passengers from Liverpool for Melbourne and Sydney, bumped the Barwon Heads, near Geelong, and became a total wreck. So close was she to the shore that a number of people simply dropped overboard and swum to land in a few yards. Eventually everybody got safely away; great fires were set, and a bullock was driven down from a neighbouring cattle station, and killed and roasted. Truly a curious, sudden, and uncomfortable introduction for visitors to a strange country, to be cast abruptly upon its shores with nothing in the way of property or belongings but what they stood upright in! All gone; the little household gods cherished so carefully over the long, weary ocean wastes, to serve as reminders in the new home that should be made in the days to come of the old one left for ever so far behind. Later on in the fifties the accommodation for emigrants on sailing vessels underwent great improvement; also was there a notable improvement in the personnel of the people themselves. 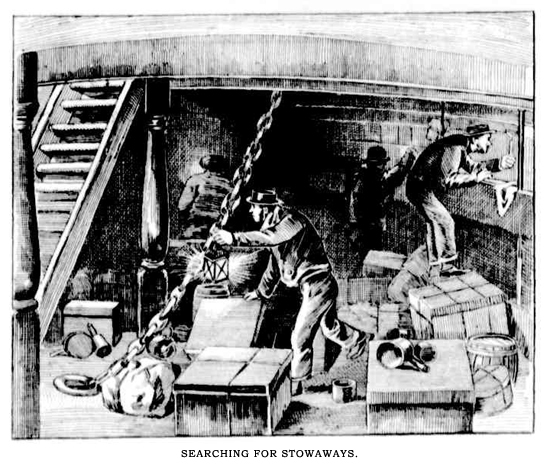 In some instances whole shiploads of workers were brought under agreement for a term of years. And these, with their wives and families, eventually remaining in the country, formed first-class settlers. Taking one example out of many, we find that the Herefordshire, an old East Indiaman, frigate built, of 1603 tons, brought out 450 navvies and their families, under a three years' engagement to the Sydney Railway Company, at 5s per diem wages. The sleeping berths, we are told, were all arranged on the main deck, in such a manner that in almost any weather the ports could be kept open, thus ensuring perfect ventilation. During the "fifties" many such a parting scene as that depicted in our illustration took place from many a British seaport town. 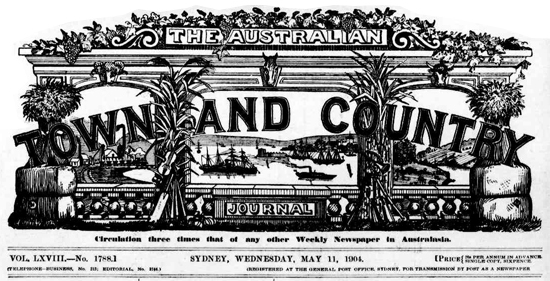 An extract from the London "Times," giving an account of the departure from the South Docks, Sunderland, of emigrants for "Port Phillip in Australia," says: "The Emigrant, a large and handsome new vessel, sailed to-day, in the presence of at least 12,000 persons, who lined the quays and piers, and cheered her on her passage to the sea. She takes out 147 passengers—116 adults and 31 children. The principal portion of the passengers are persons in the middle class of life, who, with their families, will settle down to their ordinary avocations. There are, however, two or three parties for the 'diggings.' They are provided with tents, pickaxes, carts, shovels, etc., and are armed to the teeth. Amongst the general cargo, one passenger has £1000 worth of glass. The vessel is admirably ventilated. She sails under temperance principles." That phrase, "armed to the teeth," sounds as curious now as it was unnecessary then, But there was a general opinion that the Australian diggings would turn out a replica of those in California—scenes of battle, murder, and sudden death—in place of the, on the whole, law-abiding and respectable places that they actually proved to be. And as month by month an endless procession of great ships brought the bone and sinew of the English, Irish, and Scotch counties to our shores, so gradually a comparatively sparse population of settlers spread inland and began to think of matters besides digging for gold. And to some the "land of exuberant plenty" gave of her wealth without stint; to others in but scant portion; to others yet full measure and overflowing of hardship, of poverty, of trial, and trouble. But they were no end good men and women those immigrant pioneers of the golden age; and, the fever once over, they set themselves in stern earnest, to labour late and early for the land of their adoption. And well would it have been for that land had their successes proved of the same sound metal as those who, all fearless, brought their womenkind and their little ones to help found a new nation under the Southern Cross. A good, sturdy, breed they were, who simply gave the country of their best in whatever position Providence saw fit to place them, troubling their brains with no abstruse questions or physiological mysteries. Australia could do well with many shiploads of the same strain at the present day.